Good evening everyone! 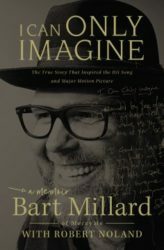 I am sure that most of my readers have heard the Contemporary Christian song “I can Only Imagine ” written and sung by one of CCM’s (Contemporary Christian Music) biggest groups MercyMe, and maybe just maybe like me you have seen the movie BUT I’m guessing just maybe you haven’t read the Memoir of Bart Millard. One might ask why should I read the book if I have already seen the movie. Well let me tell you honey, the movie really is just a condensed snapshot of Bart’s life. The book has far more details and is a fascinating read. One of the neatest things about this book is that each chapter is titled after one of MercyMe’s songs. and then a snippet from the song. Bart then takes the theme from that song and the scriptural truth behind it and weaves in through the chapter. You are left stunned seeing just how much his life has impacted the music he writes and we like to sing on the radio. Bart’s life would be defined as difficult. with an abusive father and a mother who leaves her husband and children behind (though not quite how it was depicted in the movie) it would be understandable Bart rejected any sort of Faith. BUT God…..had a much bigger plan for Bart! and just so you don’t think that life was all peaches and cream for that Texas boy once “I Can only Imagine” became a hit, you couldn’t be farther from the truth. just keep reading as you learn about the struggles that abuse can have on your life even after the abuse is over. Then there’s the death of a loved one (not referring to his dad) and the lifelong illness of a child. Bart skillfully writes a poignant autobiography that has you in stitches one minute and reaching for the tissues the next. and back to laughing just a minute more. This is the first review I have struggled to write in a long time, except for this time it’s not that it’s bad. It is because it is soooooo good! I know I am breaking how reviews are written BUT. this , this is different. I struggle in what exactly to share only because I want to share it all, but that my friends would be plagiarism, and quite frankly I like to blog! I’ve also said before that is so very hard to critique ones life story because it is their God-given story. BUT there is something to be said about the skill level and talent in writing ones story. And just like his music Bart has written this book with great passion, love and sincerity. One of the greatest things weaved throughout this book is to see his passion for ministry and to reach others with the gospel of Christ. * if you bear with me I will share a personal experience with MercyMe that exemplifies just that!- yep I said PERSONAL. “I Can only Imagine” is the MercyMe song that talks about what heaven might be like. It quickly rose to #1 on the CCM charts and surprisingly made big waves on secular radio as well. It came from Bart’s Mammaw Millard’s statement about what her son was witnessing in heaven – so not only did Maammaw Millard name the band, she also named their biggest hit. This is quite easily the best book I have read this year. It was so down to earth and real I couldn’t put it down. I seriously read it in a week….and that’s huge for me! I walked away feeling like I have been Bart’s friend for years. That is just the way he writes. Like it’s a conversation! I walked away being challenged in my faith and to forgive ! I just wanted to say THANK YOU to Bart for such a real, open and honest peek into his life. It is refreshing to know you aren’t alone in your struggles and that those struggles and insecurities don’t go away even when everything appears to be “better”. What an amazing testimony of God’s great love! Another Amazing thing is the two resources at the end of the book. The first is a bible study of sorts. It’s all about our Identity in Christ with verses that go along with each characteristic. And secondly is a run down on the history of the band….a bulleted timeline if you will. I found it interesting going through the timeline I learned a lot. Now on for my personal story with MercyMe. First off let me just say I have never met any of them in person, but in October of 2017 we were able to go see them in concert. We had a ball and they put on a FANTASTIC show (HAPPY DANCE-if you don’t know what on earth I’m talking about go to YouTube and search MercyMe and Happy Dance, you will NOT be sorry!!) . But as I said before they seek to lead people in worship and to have a personal relationship with Christ. And that was exemplified through a rare action. I have been to numerous CCM concerts BUT MercyMe s the only band I have ever seen that has put ALL of their CD’s down to just 5$ a CD. including their newest CD Lifer. They do it for Every. Single. Concert. No joke! It’s no surprise that I’m going to give this book a whopping 5 stars. Now go get the book and be blown away! Thanks so much to BookLook Bloggers for providing me with a free copy of this book for reviewing. They never expect a positive review just my honest opinion and that is AWESOME! This entry was posted in book reviews and tagged book review, Imagine.